Maputo — Mozambican journalist Amad Abubacar was beaten and starved while in military detention in the northern province of Cabo Delgado, according to the human rights commission of the Mozambique Bar Association (OAM). A team from the commission headed by its chairperson, Ricardo Moresse, met with Abubacar earlier this week in the Nieze prison, in the provincial capital, Pemba, where he is currently being held. Abubacar told Moresse that he had been seized by the police on 5 January in his home town of Macomia. The police handed him to the military who drove him to the neighbouring district of Mueda where he was illegally incarcerated in a barracks. He said the soldiers beat him and forced him to sleep handcuffed for several days. Abubacar said he had been denied food for some days, and so when he was returned to Macomia, the district attorney had to buy him food before proceeding with an interrogation. "I wasn't able to speak, I was trembling with such hunger", said Abubacar. According to Moresse, Abubacar said his state of health is now stable, although he still feels some headaches and fever. Abubacar, speaking to Moresse in the presence of the prison director, asked that his case be processed as quickly as possible, since he needs to return to work. He is a journalist on the Nacedje community radio in Macomia which is owned by the public Mass Communications Institute (ICS). The ICS delegate in Pemba, Paulo Cazimoto, confirmed that he had worked for the ICS for the past 10 years. Morrese assured Abubacar that the OAM will continue to follow his case. Abubacar's own lawyer is attempting to secure the journalist's release on bail. The Public Prosecutor's Office has charged Abubacar with "violation of state secrets using a computer" and "public instigation to crime using a computer". The evidence for these charges is flimsy. The prosecution claims Abubacar had a list including names of people involved with the Islamist insurgency in the northern districts of Cabo Delgado. The only other evidence so far sited against him is that he was undertaken after journalistic work without the knowledge of his superior at the ICS. 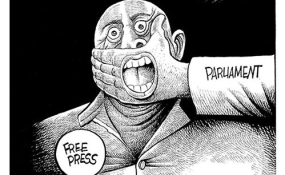 Replying to this accusation, the Mozambique chapter of the regional press freedom body MISA (Media insituition of Southern Africa) has pointed out that good journalists do not ask permission from their superior every time they come across an important story. In Abubacar's case, he was seized when he was photographing and talking to internally displaced people fleeing to Macomia town to escape from terrorist attacks in the interior of the district.